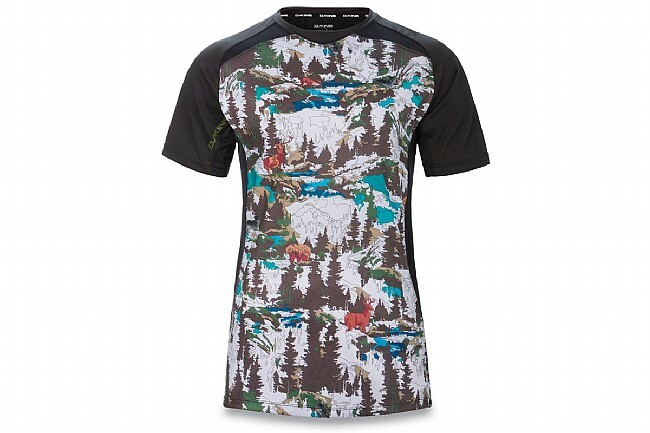 The Men’s Charger Shortsleeve Jersey by Dakine was designed with functionality and comfort in mind for mountain biking during the warmer months of the year. The quick-dry recycled polyester fabric contains two impressive technologies: Channel Flow and Polygiene Odor Control. Channel Flow is a moisture management technology that promotes dryness by moving moisture away from the body. Polygiene Odor Control contains a substance derived from recycled silver that eradicates odor-causing bacteria. To promote comfort and ventilation, the Charger Jersey features a relaxed fit and mesh panels on the front, back, and sides which have 4-way stretch properties that enable full freedom of motion.